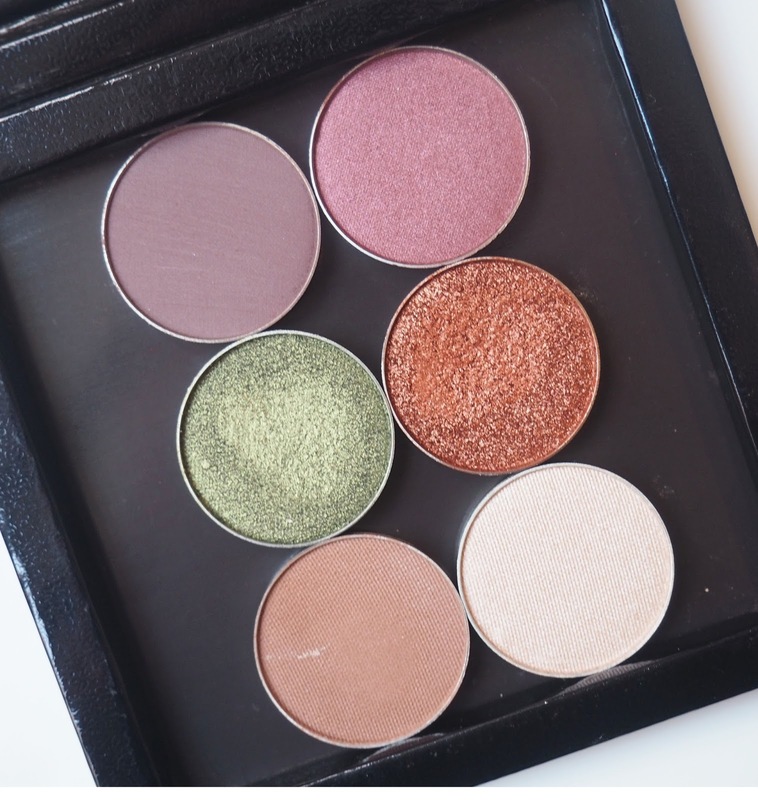 A few months back I wrote a post about my first Make Up Geek shadows (Click here to have a little read) and as I've recently expanded my collection I thought I would share these with you all too. 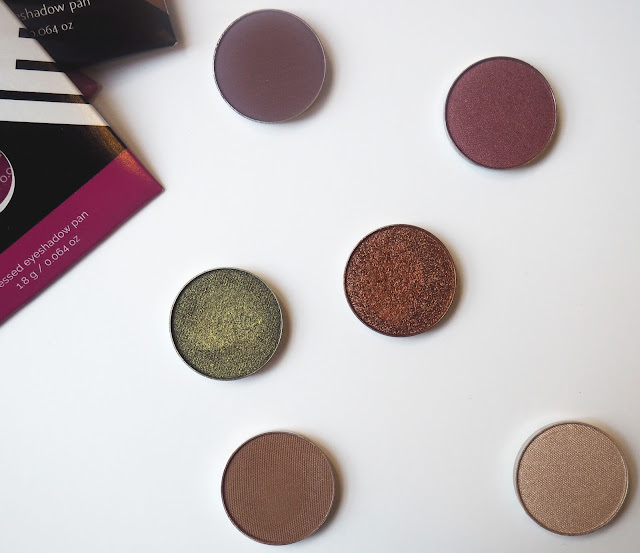 Make Up Geek is an affordable make up brand thats available to buy in the UK on BeautyBay. I did notice the price of these has crept up to £6 for a standard shadow pan and £9.25 for a foiled shadow, it's still an absolute bargain for the quality though so I'm not too snotty about it. This time I got six shades, four of the regular formula and two of the foiled colours. First off I got Frappe which doesn't look very exciting I know but a mid tone, matte brown always comes in handy day to day, you can never have too many I say! I've been using this to add more definition to the crease of my eye and to blend out darker brown shades, I particularly like this as it's not too warm or too cool which makes it really versatile. I have a feeling I'll get through this pretty quickly. Shimma Shimma seems to be very infamous in the range so I figured I better add it to the bag. It's a pale champagne shade, which again has lots of different uses. It works great all over the lid and also as a highlight for the brow bone and inner corner, which is how I have been using it the most. I also picked up another shimmery shade which is Anarchy, a dupe alert here peeps, if you think Mac Cranberry then you're not far off with this. These red toned shades in my opinion are an absolute make up bag staple at this time of year so I'm always happy to get a new one. I've been pairing Anarchy with my next new shade Vintage, they make such a lovely duo. When I first used Vintage I was a bit paranoid that the matte, deep purple made me look like I have a pair of black eyes but when I then went in and added Anarchy to the lid I really liked the smokey eye they created together. Now for the two colours that I am absolutely blown away by. I have seen tonnes of pictures on the foiled shadows and always thought they looked amazing so I couldn't resist getting a couple to test out. Let me tell you these shadows are so smooth, pigmented and sparkly it's insane. One swipe of these are stunning and the more you build them up the better they get. I got the shades Flamethrower which is a seriously intense Bronze and Jester which is a beautiful Olive Green shade. I will be investing in some more of these very soon, in fact I might have to order some more of these this evening, impatient I know! I'm definitely going to continue adding to my collection of eyeshadows but I do feel I need to explore this brand a little more and discover other products. If you have a favourite then please leave me a comment my lovelies.